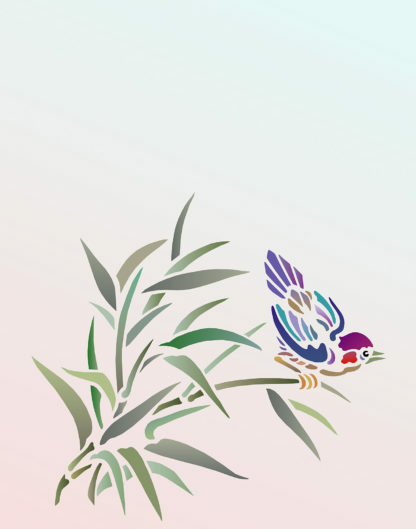 The graceful Bamboo and Bird Stencil is a beautiful small motif stencil of a delicate finch-like bird perched on a spray of bamboo. 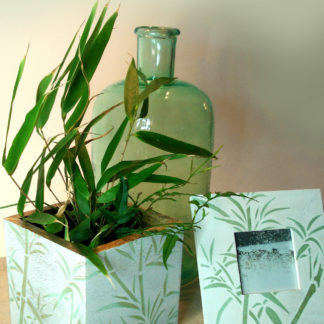 Use it to stencil smaller objects and accessories such as greeting cards, cushion covers, boxes or as a random motif on walls and fabrics. 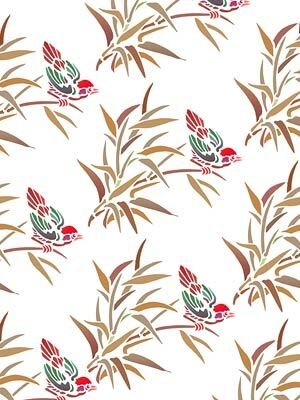 This easy to use one sheet stencil works well in a multitude of applications and is also beautiful in gilded or metallic finishes for a Chinese look. See size and layout specifications below. 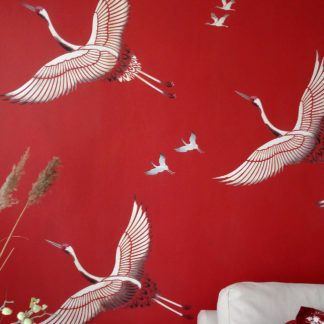 Above – the Bamboo & Bird Stencil in Very Berry, Raspberry, Sienna, Mocha, Chocolat and Oasis Stencil Paints. 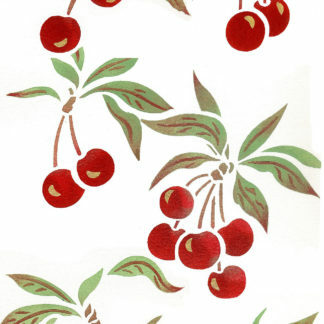 Below – the same colours are used and the motif is repeated in staggered rows – ideal for fabrics and smaller wall areas or cupboard doors. 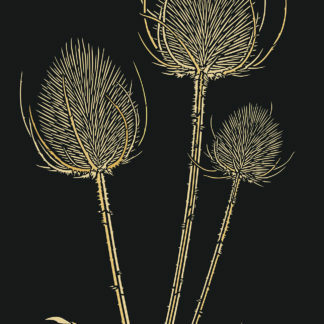 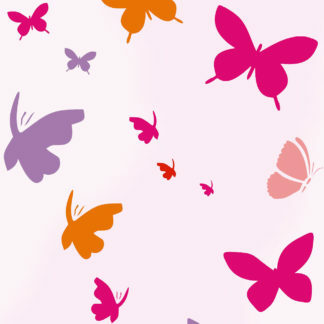 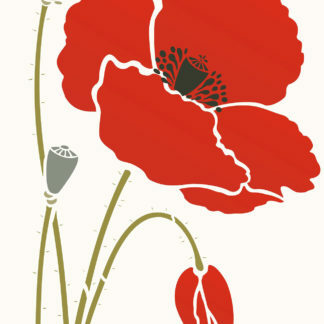 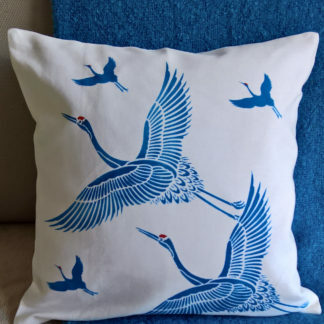 See also the Bamboo and Butterfly Stencil for a complementary pairing to this design. 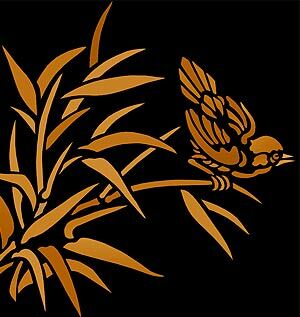 Above – the Bamboo & Bird Stencil in Harvest Gold and Sienna Stencil Paints with Antique Gold Metallic Paint highlights on a black background for classic oriental style. 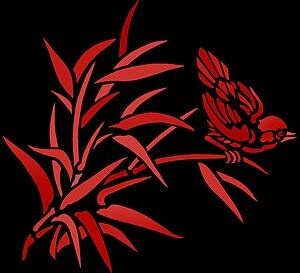 Above – the Bamboo & Bird Stencil in Very Berry and Azalea Stencil Paints on a black background for an oriental look. 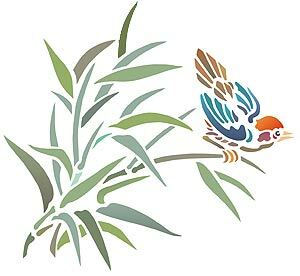 Above – the Bamboo & Bird Stencil in Eucalyptus, Willow, Hedgerow, Verbena, Atlantic Blue, Cyan, Kingfisher and Seville Orange Stencil Paints. 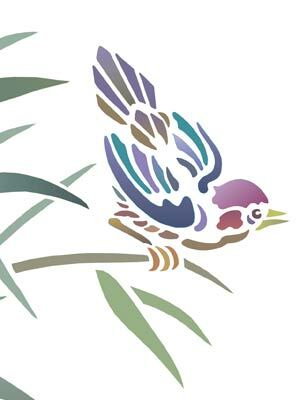 Above – close up detail of the bird of this stencil design in Emerald Forest Green, Olive Grove, Verbena, Atlantic Blue, French Lavender and Damson Stencil Paints. 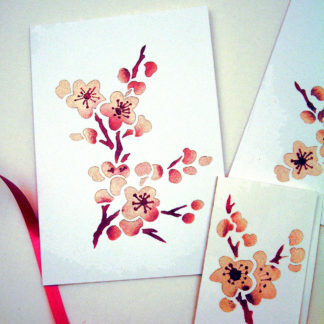 One layer stencil approximately 20cm (8″) wide x 19cm (7 1/2″) high. 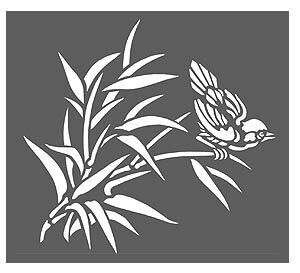 Left – layout of the stencil sheet of the Bamboo & Bird Stencil.